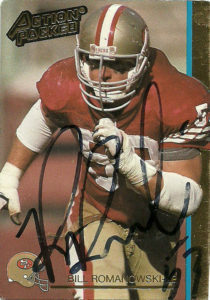 Ah now Bill Romanowski had some awesome cards. I mean he looked like a mean caveman who just had survived a knife fight. With tattered taped gloves and that war paint, he went from just being a linebacker to being a mean and nasty linebacker pretty quickly. 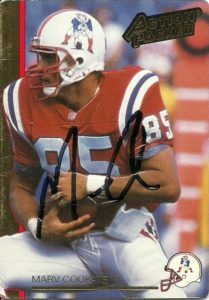 His ProSet 1990 entry and Action Packed 1992 are among some of my favorites, and his GameDay card showcases his athletic ability as he gets up in the air, perfect for that tallboy card. 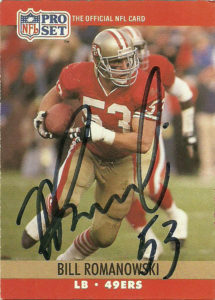 I really didn’t know who Bill Romanowski was at first when he popped onto the scene for the 49ers. Initially- you didn’t hear much about Bill. He was considered, I guess, a model citizen until he started having altercations on the Eagles- a clear 7 years into his career. It’s not really clear about when he started abusing steroids while playing, but he admitted during a 60 Minutes interview that he was always cutting edge and staying one step ahead of the league. As of 2017 he owns Nutrition 53 and also is involved in NASCAR. Bill is a very outspoken and unfiltered guy, and his sometimes, lack of political correctness, has gotten him in trouble on social media. He also appeared on the cover of Midway Games’ Blitz: The League and as a prison guard in the remake of the movie The Longest Yard. In addition he’s done some coaching, and has expressed interest in returning to the NFL in that capacity. During his career he was an easy plug-and-play linebacker. Instinctual, intelligent, and with solid coverage skills, by the time he hit his stride, Romanowski was not only one of the better linebackers in the league, he was a throwback to the gladiators of old, with that nasty streak. He is also listed as the 5th dirtiest player in sports history by ESPN. 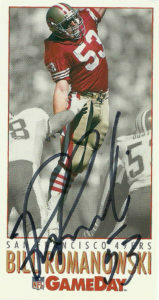 After playing for the 49ers through 1993 and winning 2 Superbowls, Bill joined the Eagles for the 1994 and 1995 seasons. He’d then head over to the Broncos and earn 2 more rings playing for them from 1996-2001. Afterwards he’d play 2 more seasons in the Raiders organization. He earned 2 Pro Bowl nominations (1996, 1998) and posted a career high 104 tackles in 1993. I’m not sure where to start with Erik Kramer. I tried him back in 2011- shy a few months before his son tragically died of a drug overdose. Things spiraled out of control so much that Kramer in 2015 attempted to take his own life with a gun. Somehow he managed to survive and over the past two years has been rising from the ashes of his own personal pain. Kramer went to college at NC State. 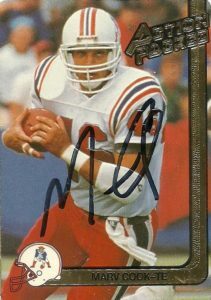 He was the team’s starting quarterback in 1985 and 1986. Posting solid numbers as starter, over his time with the Wolfpack, he threw for 4,602 yards, 30 TDs/ 28 INT, on 334 completions and 616 attempts. Kramer also posted an 11-11-1 record as a starter and earned ACC Player of the Year honors as a Senior. 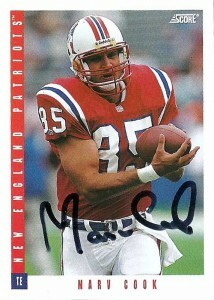 He went undrafted in 1987 and initially signed with the New Orleans Saints, but was subsequently released. Quickly he was signed by the Atlanta Falcons as a replacement player during the 1987 strike. 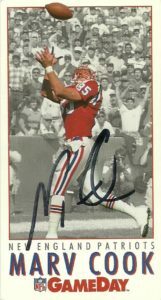 Erik joined the Calgary Stampeders in 1988. Playing in 5 contests he threw for 5 TDs and 964 yards. The next season he’d blow out his knee and not see a snap under center. Afterwards he was released by the Stampeders. Erik’s story could’ve very easily ended there, but he chose to give it another shot in the NFL, signing with the Detroit Lions after getting spotted during a tryout by offensive coordinator Mouse Davis. 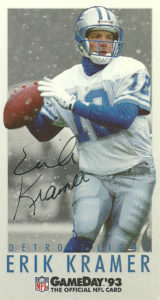 Kramer’s string of bad luck continued, as he suffered a season ending shoulder injury during the 1990 preseason. The Lions had a classic quarterback rivalry going on between Andre Ware and Rodney Peete going into 1991. 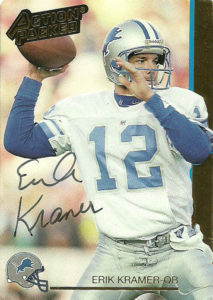 Erik Kramer was an afterthought on the squad. This worked to his advantage as he was a consummate professional in preparation for each and every game. He supplanted Ware and then bode his time until Peete was injured. Kramer picked up and after a rough start or two, he led the Lions on a 6 game winning streak to conclude the season. The Lions made the playoffs, and Erik set team playoff records with 29-of-38 passes for 341 yards and 3 touchdowns as the Lions ambushed the Dallas Cowboys. It’d be the Lions first playoff victory since 1957. It would be safe to assume that after the season Kramer would’ve been chosen to be the hands down starter for the Lions, right? Well this is the Lions and that didn’t happen. Instead 1992 opened again with another open quarterback competition- this time lasting into the regular season. While it finally took Kramer being named starter and then rallying Detroit to a 3-1 record down the stretch to win the division title, the Lions lost a home wild card game to Brett Favre and the Pack 28-24. 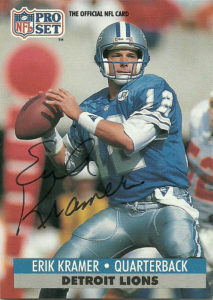 Detroit had another bumpy season in 1993 and while Kramer went 3-1 as a starter, the Lions ran out and signed Scott Mitchell, effectively ending their quarterback carousel in 1994. Erik in the meantime took a flyer with the division rival Chicago Bears. While his first season there was met with mixed results due to a separated shoulder, there is no question that he had an impact season in 1995 setting personal highs and franchise records going 315 of 522 for 3,838 yards with 29 TDs to only 10 interceptions. Kramer hung around with the Bears another 3 injury plagued seasons before abruptly retiring midway through the 1999 season with the Chargers due to a persistent neck injury. Kramer was the definition of the ‘walking wounded’ during his playing career in the league. He gave up his body to injury leading Detroit and Chicago back to periods of respectability. Concussions may have also contributed to his severe depression as well. It is said that the bullet traveled through Erik’s chin, tongue, nose, and out the top of his head. Amazingly, the damage was so clean, and the medical attention paid to him was so quick, he survived. Much like his playing career- Kramer quickly has moved to rise from controversy and loss, making an impressive recovery- and coming to an understanding that life is worth living for. Pro Set struck gold in Erik’s initial release in their 91 update set with a nice straight on shot of him. This was Proset at their best: minimal design, dynamic action photography, and an unobtrusive logo. I was a big fan of Action Packed- but their 92 set annoyed me by flipping profile information on the back. The player name type was also just a tad too small. Gameday barely tweaked an overall successful design over the entire lifetime of the brand. I liked this 1993 issue of Kramer in the elements.